Moving on from the cast iron and on to the actual food. 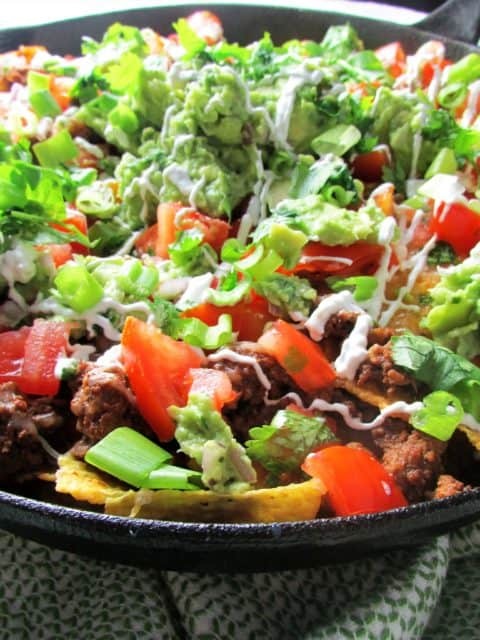 I think that nachos have a bad rep. They’re bar food. Cheesy, greasy, loaded, fatty (re: delicious) – but ultimately defined as “unhealthy” food. Rightly so too. 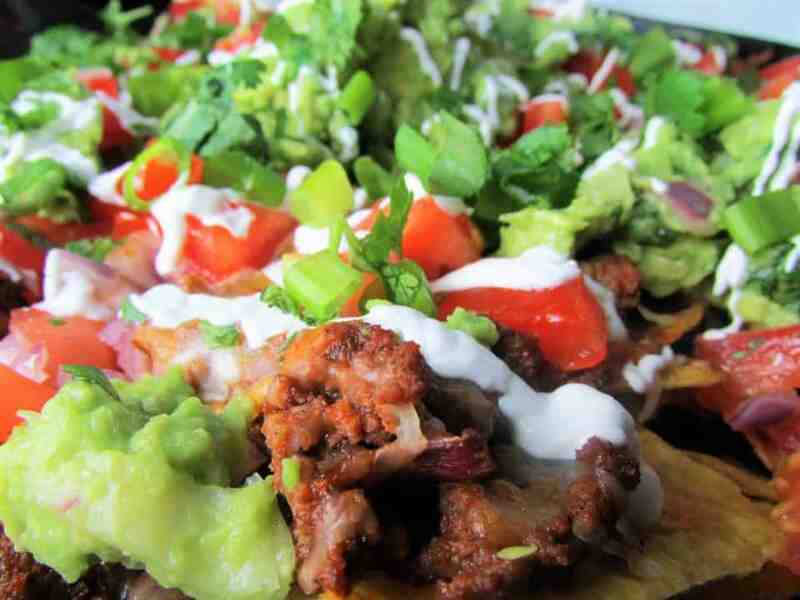 On average, nachos in a restaurant are about 1100-1500 calories. Sizes all vary, but that’s quite a lot for an appetizer. 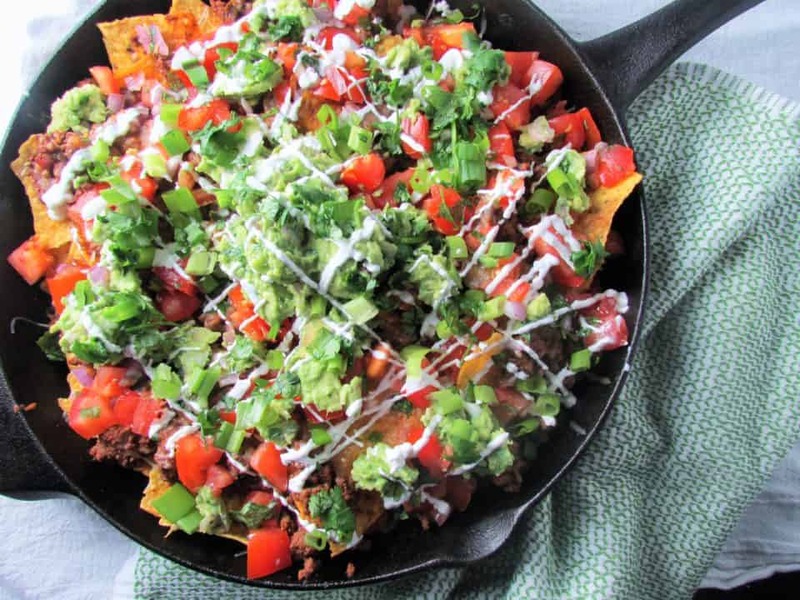 The balance of these loaded skillet nachos though is to clean it up without losing all the best parts of it. Besides, the best of both worlds is to be able to eat your favorite comfort foods that you crave without it destroying your intake for the day. This version will be big enough to serve 5 for dinner at only 340 calories or less for more people as an appetizer. First things first – the type of meat you’re using makes a huge difference, if using any at all. I opted for 93% lean ground beef, but shredded chicken breast also works really well. I also used yellow corn tortilla chips, but this is totally a preference. The last big thing to swap is the cheese – I used reduced fat as opposed to whole fat. Now there’s a few separate recipes that go into make this. First the beef: chop up some yellow onion, sauté in canola oil for a few minutes. Add in the ground beef and 1 cup of water. The water will make sure the beef doesn’t clump up and keeps the texture finer. Season with spices and add in tomato paste. Let this simmer until reduced. 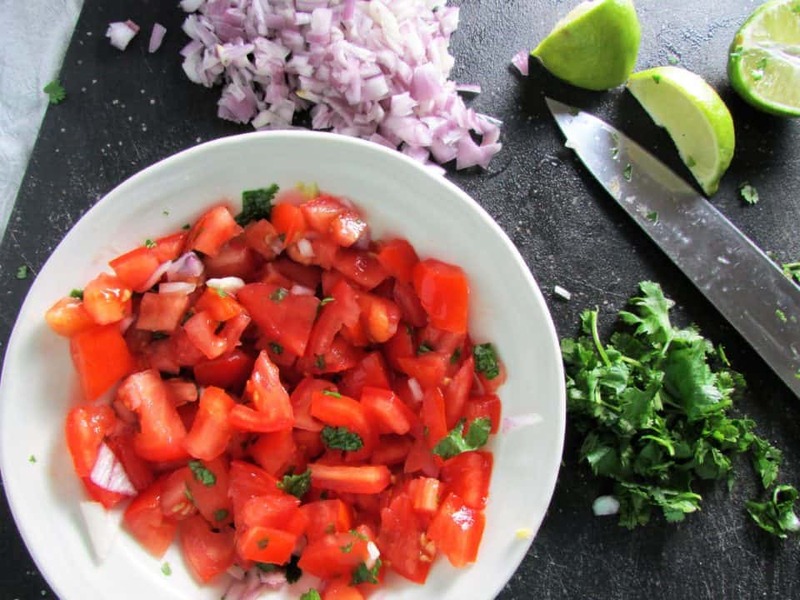 Pico: chop up your tomatoes, red onion, and some cilantro. Mix together, add some salt and lime juice. The correct way to make pico is also to add some diced jalapeno – which I am JUST starting to get into. I told you I’m afraid of spicy things! Guacamole: slice your avocado and mash slightly (keep chucks on the larger side). Add in red onion, cilantro, juice from half a lime, and some sea salt. You can go crazy with adding some tomato, jalapeno, or garlic – but I find that the avocado really stands out when you keep it simple. 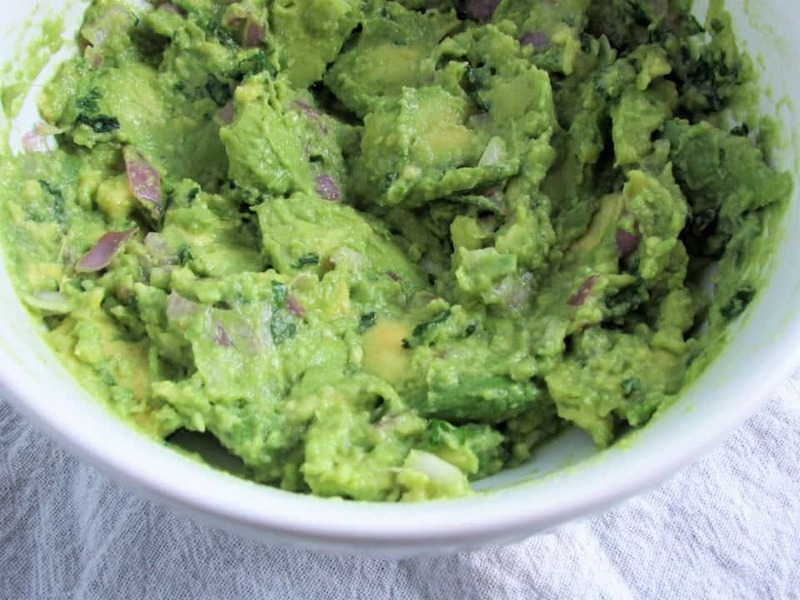 As you mix, the avocado will becomes more smooth, so don’t mix too much because guacamole should be a little chunky. Cut up or prepare any other toppings you want to add like scallions, olives, sour cream, corn, or black beans. On top add all the meat. Next layer of cheese. Mix this up just a little so the meat can fall to the bottom layer too. Put this in the oven for no longer than 10 minutes or until the cheese is melted and chips are toasting. When it comes out, top it with all your vegetables. Note: This dish does not save well because the chips will get soggy! If you don’t think you’ll finish it all, only assemble what you’ll eat and save each ingredient separately. You can also make half the recipe. Heat the cast iron (or another skillet) on med-high. Add in canola oil and yellow onion. Let sauté in canola oil for a few minutes until it starts to brown. 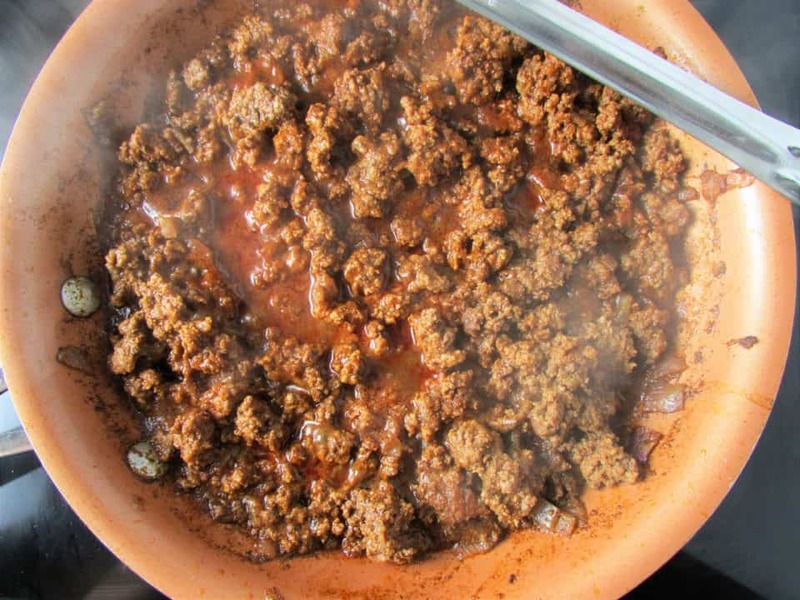 Add in the ground beef and 1 cup of water. Season with spices and add in tomato paste. Let this simmer until reduced. Preheat oven to 400. While the beef is cooking, mix together the ingredients for the pico de gallo and in another bowl the guacamole. Set aside. Layer cast iron with tortilla chips, half of cheese, rest of tortilla chips, all of the beef, rest of the cheese. Mix this up just a little to disperse the ingredients. Put into oven for about 10 minutes or until cheese is melted and chips are toasting. Prepare any other ingredients you want to top. When it comes out top and serve!